Are you in the marker for Bluetooth Speakers? Check out Capdase Beat SOHO. I listed down ten reasons why I love this Bluetooth Speaker more than any other brands in the market. Let’s face it, we all hate wires. The longer it goes, the more time we have to do the dirty untangling works. But in the age of consumer electronics boom, we have been treated with different accessories using wireless connectivity such as Bluetooth, Beacons and Infrared. Speakers, being our multimedia device’s best friend, are also pushing towards wireless technology. Capdase, a leader in gadget accessory market, intros the Beat SOHO Portable Bluetooth Speaker. I have listed down, right after the fold, ten reasons why I love this Bluetooth Speaker more than any other brands in the market. Being stylish and minimalist at the same time make the Capdase Beat SOHO Bluetooth Speaker on top of my list. It is solidly built so you don’t have to worry about it getting tossed or nudge on top of your table. The Capdase Beat SOHO Bluetooth Speaker perfectly fit your desk with it being the size of a regular coffee cup. Aside from the prominent speaker grills that you can find on the speaker’s top, this device offers few controls along the lower side of the device – the volume rocker with tracks scrolling; and the 3-in-1 slider switch for powering it on, choosing Bluetooth mode or setting it to auxiliary mode. The mini USD port is located on the other side as well. Yes, you heard it right. The Capdase Beat SOHO allows you to answer calls from your smartphone using its hands-free microphone. This Bluetooth Speaker is offered with three different paintjobs – red, black and silver. I preferably love the latter. Of course, the main deal-maker of this speaker is its wireless capability, but you can also opt to use it in auxiliary mode (connecting it with cable using the 3.5-millimeter audio jack). This is suitable if you’re running on limited battery; we all know the Bluetooth drains your battery fast. Speaking of battery life, the Capdase Beat SOHO Bluetooth Speaker may be small but it packs a lot of juice. It could reach 9 hours of continuous playback. Now, that’s a worker. The Beat SOHO is a master of bass primarily because of its 300-gram weight. This also prevents the whole speaker from “tossing around” the surface when you’re having it in full-blast volume. Sound quality is also clean with less noise and distortion in extreme high volume. If you are always on the go, this Capdase offering will be a great companion. Technically, the speaker fits in your pocket. It’s also the best thing to have if you’re travelling, you can stuff it anywhere in your baggage. When I say long range I mean at most 10 meters - yep Bluetooth standards, in case you didn’t know. This may not be new to any other Bluetooth speakers but in comparison to wired ones, you can easily count this as a huge advantage. Its introductory price is Php 1,950. 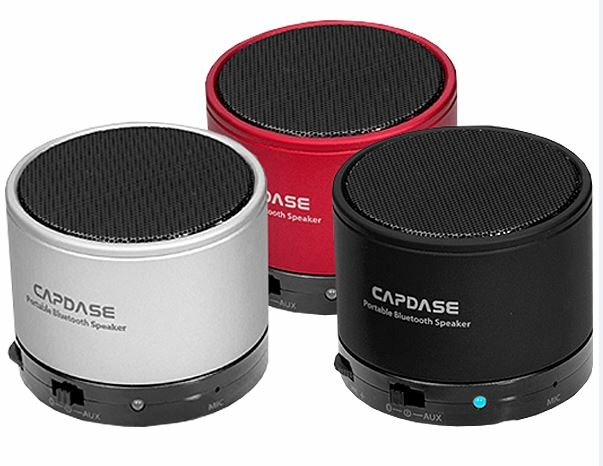 Comparing to other speakers, the Capdase Beat SOHO Bluetooth Speakers gives more value to you money. Capdase and Cebu Blogging Community is giving away Beat SOHO Bluetooth Speakers in the CBC First Anniversary event. Cheers to one year of excellence!